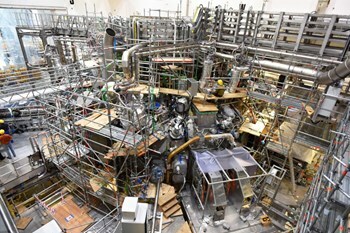 With the successful completion of the testing of all seventy magnetic coils, the functionality of the key technological components for the Wendelstein 7-X fusion experiment is assured. Later this year, the device should produce its first plasma. With the successful completion of tests on its 70 magnetic coils, the Wendelstein 7—X fusion device is now one step closer to first plasma. Located at the Max Planck Institute for Plasma Physics in Greifswald, Germany, the device will be the world's largest fusion device of the stellarator type when it turns on before the end of this year. In preparing for operation, each technical system is being tested in turn. Since late April 2015 the focus has been the magnet system, a set of 50 superconducting coils whose job it is to create a stable, thermally insulating magnetic cage for the plasma, surrounded by a second set of 20 planar superconducting coils. In the most recent tests, the magnet coils were tested under current—first in groups and then as a complete set. "Everything agrees well with the calculations," reported Hans-Stephan Bosch, department head of Wendelstein 7-X Operation on 17th June. This was the first time that all coils together were supplied with current up to the ultimate required value of 12.8 kiloampere. "The complete set of coils has withstood all technical tests," said Bosch on 6 July 2015. "This assures the required functionality of the primary components of the system. We can now take up the challenge of the next major step, the measuring out of the magnetic surfaces." This will test whether the coils produce the plasma cage in the desired form and shape.